Nativity season is here! All across the country, children are dressed up as assorted shepherds/sea creatures/farm animals, following a star to a plastic baby wrapped up in a tea towel. But what are they actually following? Despite its ubiquity in the Christmas canon, the Bethlehem star only appears in the gospel of Matthew. That hasn’t stopped astronomers puzzling over whether it might be linked to a real celestial event. 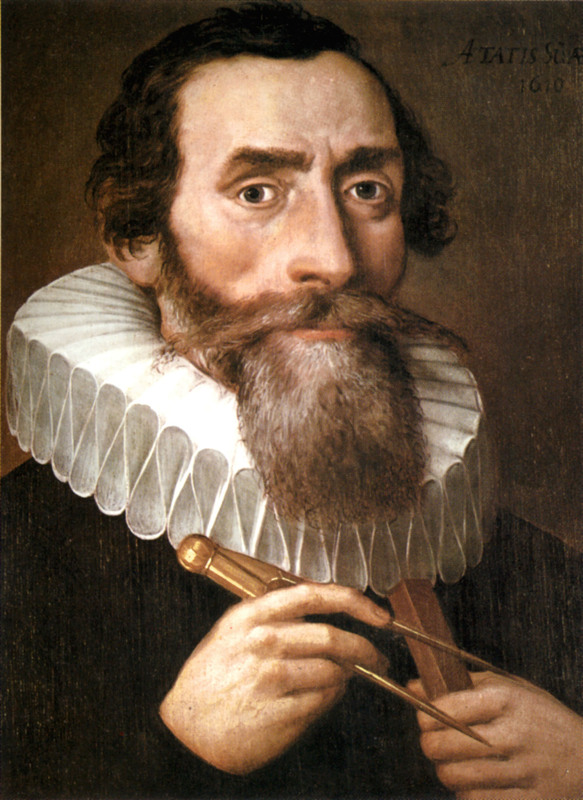 In 1614, Joannes Kepler worked out that the year 7 BC saw three conjunctions of Jupiter and Saturn, which he thought would be capable of creating a nova, explaining the star’s appearance. Kepler was right about a lot of things ,but in this case he was wrong about the nova, and about the conjunction – modern calculations show there was nearly three degrees between the planets. Was it a meteor? 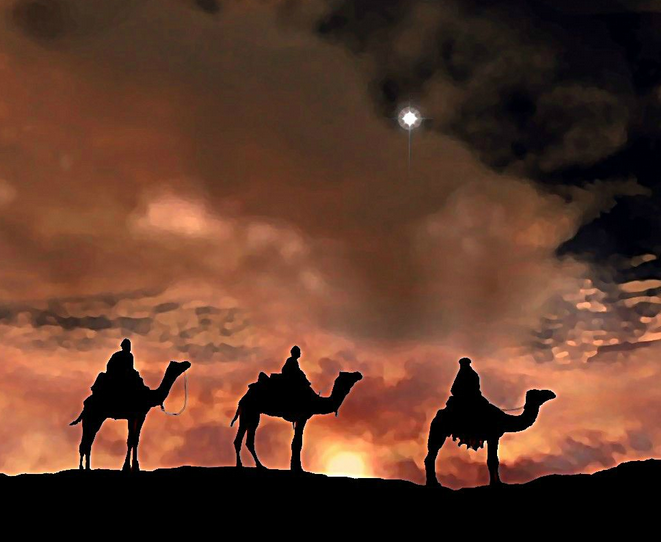 That was the theory of no less than Patrick Moore, who suggested the magi might have seen two bright meteors – one at the time of Jesus’ birth, and another when they reached their destination. 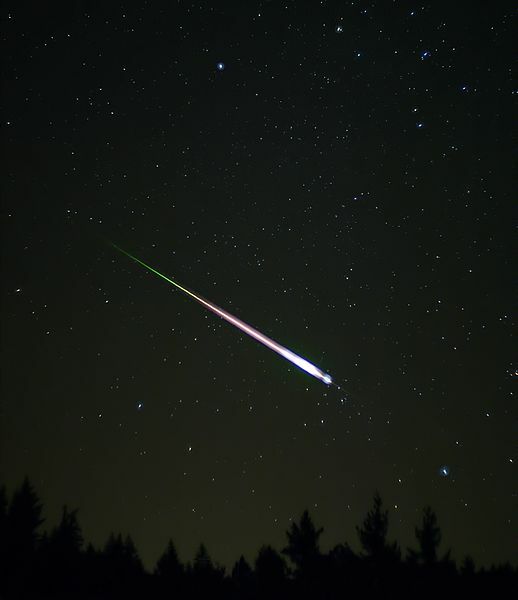 Would a meteor really have been so unusual an event that it found its way into the gospels? Without our modern light pollution, they would have been even easier to spot. And they last a few seconds – surely not enough time to persuade three men usually described as ‘wise’ to trek across a desert for weeks, following a star that had long since burned out? 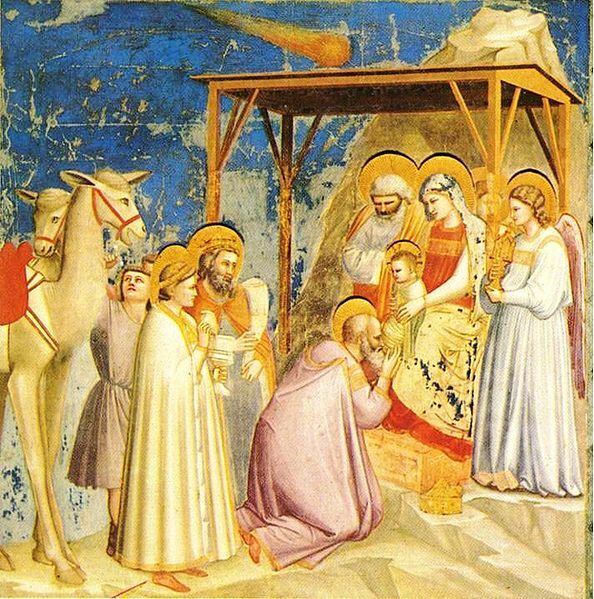 Giotto’s The Adoration of the Magi (c 1305) The star is purportedly modelled on Halley, which had been sighted 4 years prior to the painting. A comet? When Halley’s comet was correctly predicted in 1758, conveniently showing up on Christmas Day, everyone got very excited that it might be the solution – having worked out it returned every 76.5 years, astronomers realised it would have been visible very close to the time of the Nativity. Unfortunately, there’s a fairly convincing account of a comet matching Halley’s description from China in 12BC, so unless it took the magi over a decade to reach Bethlehem, Halley seems unlikely. We’ll probably never know. There is another Christmas star, however, that’s very definitely astronomical in origin. This time, instead of appearing in Bethlehem, it turned up in the village of Barwell in Leicestershire, on Christmas Eve, 1965. One of these places is Barwell, Leicestershire. Once the fragment, described as ‘the size of a desk’, entered the atmosphere, a significant amount burned up. There was still a sizable chunk left – about the size of a Christmas turkey, apparently. The flaming turkey’s arrival was follwed by a sonic boom as the ~4500 million year old rock exploded into thousands of pieces, ranging from fragments to large chunks that showered over the village of Barwell. D.S. 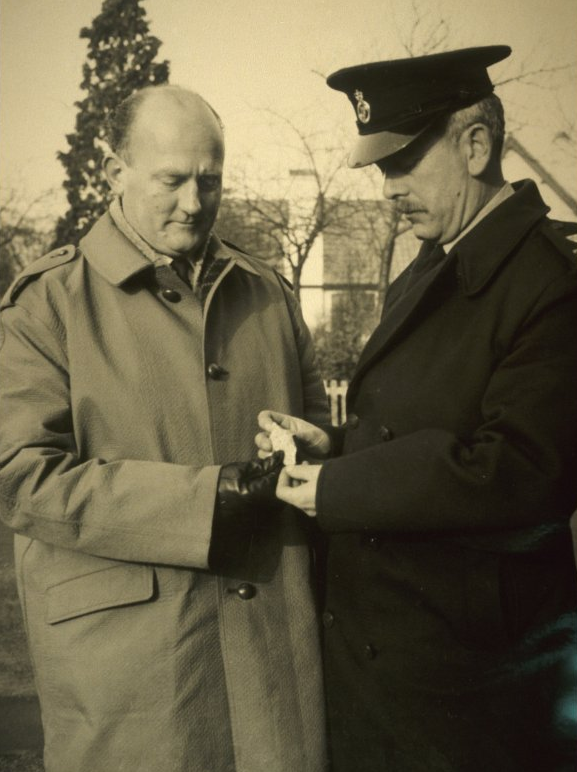 Bailey and PC George Scott examine a fragment of the meteorite. A part of the meteorite fell through Mr and Mrs Crows front window prompting them to call the police thinking it was young people causing trouble. Miraculously, no one was hurt. It was lucky indeed that the shower did not hit a more built up area, particularly on Christmas Eve, when shoppers would have been out in force. The meteorite was identified as a Chondrite, a type of stony meteorite. Chondrites are as old as the solar system and are largely unaltered since their formation ~4500 million years ago. They were formed when various types grains and dust present in the early solar system accreted to form early asteroids. Their study is extremely useful to provide helpful clues about the origin, formation and age of the solar system as well as the origin of life. They are also the most common type of meteorite that fall to earth. The arrival of the meteorite, and all its many pieces, brought great interest from meteorite hunters and museums around the world. Museums were offering money for every piece. Patrick Moore turned up shortly after the event, found a piece and delivered it to the local museum. A piece of the meteorite is on display at the Herbert Museum in Coventry who claim it is the largest metorite fragment known to have fallen in Britain and weighs 412g. Keith Platts, whose family found a piece of the Barwell meteorite appears in this short film about his family’s experience of the meteorite shower. In recent years there have been news stories regarding the auctioning off of fragments collected in 1965. One particular lump of meteorite had originally been sold to Leicester Museum for £39.50 by the Platts family, it was then subsequently sold by Scottish collector Rob Elliott who auctioned the 2 lb lump of rock in 2009 to the value of £8,000. Which would have covered the cost of quite a lot of Christmas turkeys, flaming or otherwise. One of these objects is a flaming turkey. Brought to you by Policy Assistant Flo, and Science Communicator Sarah (who particularly wants to claim credit for the flaming turkey). Tags: advent calendar, Barwell, christmas, comet, geology, hazards, history, Kepler, meteor, Patrick Moore. Bookmark the permalink.